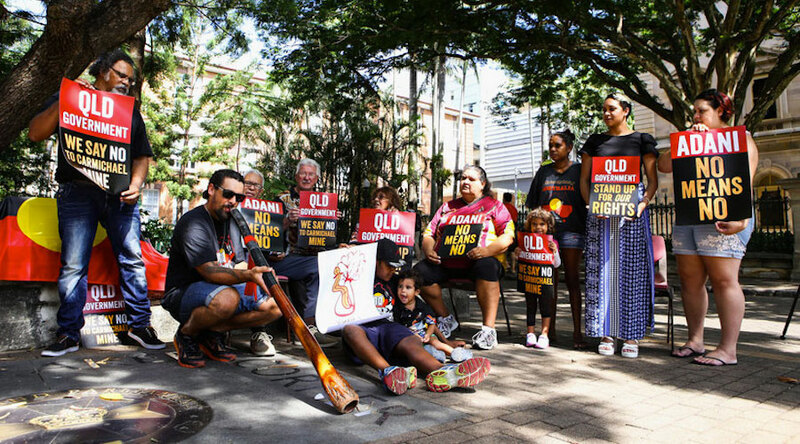 Wangan and Jagalingou People protest against Adani's Carmichael project. Photo by W&J. Representatives for the Wangan and Jagalingou People said they were forced to sign an Indigenous Land Use Agreement at the Native Title Tribunal for Adani’s Carmichael mine in Queensland, northeastern Australia. Interviewed by ABC News, a spokesman for the Indigenous group, Patrick Malone, said some of its members oppose the $12 billion coal and rail project and had taken legal action in an attempt to block it. However, Malone said that the fraction that supports the mine received a letter from Queensland coordinator-general notifying them of the starting of proceedings to extinguish native title against all Wangan Jagalingou Country. "The seven of us decided it's all about having our native title recognised so we went back to Adani and said we're willing to negotiate ILUA with you," Malone said. The ILUA or Indigenous Land Use Agreement states that traditional owners support the Indian conglomerate’s plan. According to Malone, Adani guaranteed that local Indigenous people would get at least seven-and-a-half per cent of jobs at the mine and a yearly compensation payment or royalty. The company also promised them to set up a bus service that will move around the camp and between the camp and the nearby town of Clermont. Carmichael, the largest single investment by an Indian corporation in Australia, is meant to produce 60 million tonnes of thermal coal a year for export, fuelling power generation for 100 million Indians. Coal from Carmichael is also expected to be sold in Vietnam, Bangladesh, China, Philippines and Pakistan. "Most of the environment approvals and the other approvals that Adani needed had already been granted and were in place and the only thing outstanding was to do ours [approval by native title claimants], and I along with the other six really didn't want to lose our native title," Malone reiterated. Yet, Wangan and Jagalingou claimants who oppose the mine will probably continue their legal action to challenge the land use agreement. On December 8, 2017, they issued a media statement saying that the Traditional Owners Family Council is troubled by the decision of the National Native Title Tribunal to register the Indigenous Land Use Agreement for Adani before their legal challenge scheduled for March 2018 can be heard in Federal Court. “W&J representatives say they have never given consent or signed the ILUA and are not bound by it. The ILUA was rejected by W&J again at a claim group meeting only days ago. Representatives of the native title claim group have filed an application in the Federal Court for an injunction against Adani and the Queensland Government, to restrain them should they attempt to use the registration of the ILUA to extinguish their native title, under its terms, before their challenge is resolved in the courts,” the statement reads.